One of the new ingredients we’ve encountered in our international market adventures is Chinese five spice- a warm blend of spices that’s perfect for a winter stew. Apparently, the spice blend contains fennel seeds, cloves, cinnamon, star anise and Szechuan peppercorns, but other spices are often added. Though we weren’t sure about how all of those sounded when we first found the spice jar, it’s one of those situations where the sum of the whole is far greater than its parts. 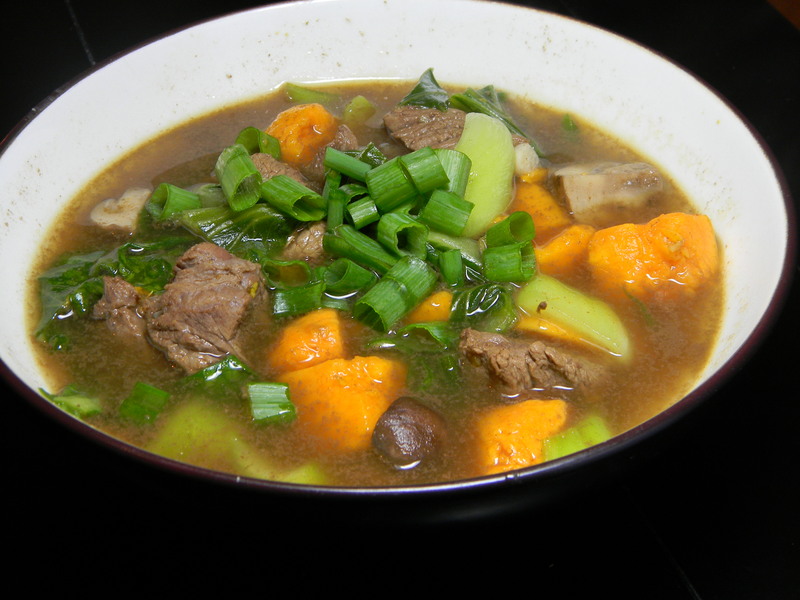 This is one of those recipes that we found simply by typing in ingredients that we needed to use to a search: bok choy, sweet potatoes, and beef. Given that criteria, this recipe came right to the top of our Google search. We really enjoyed it when we fixed it on a cold night a couple of weeks ago, and we hope that now it will be on your radar for something to fix on a cold, snowy night soon!